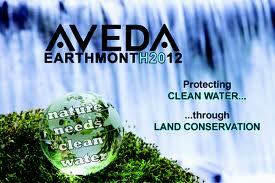 For Earth Month 2012, we have teamed with Aveda and created a page to help raise money to send to the Gulf of Mexico! We are trying to create more clean water for the world to have! One of our wonderful Master Stylist’s, Megan, has created a page on Aveda’s website to help spread the word and generate donations for such an awesome cause! We encourage everyone to help provide clean water for the world! Here, you can donate, read documents we have posted, learn about earth month and the world around us, and participate in a discussion to share ideas on what you do for Earth Month!